During the 1960s Portsmouth was an exciting place to be. Many teenagers who escaped parental restrictions to spend a few hours with their peers in the city’s clubs, venues and coffee bars still carry fond memories of those special times. 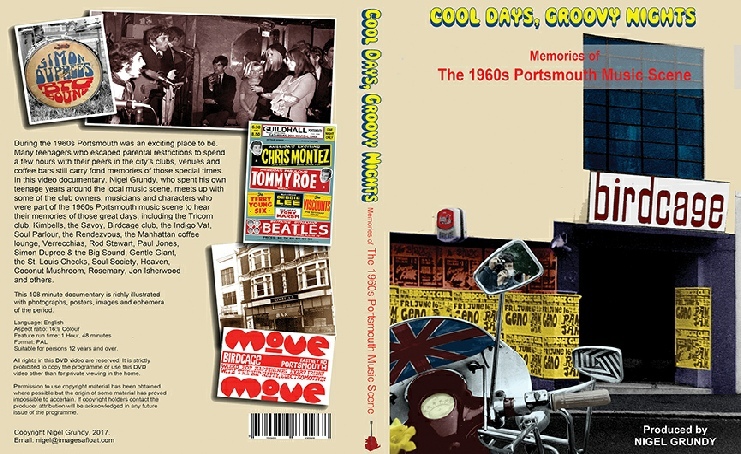 In this 1 hour 50 minute video documentary, Nigel Grundy, who spent his own teenage years around the local music scene, meets up with some of the club owners, musicians and characters who were part of the 1960s Portsmouth Music Scene to hear their memories of those great days, including the Tricorn club, Kimbells, the Savoy, Birdcage club, the Indigo Vat, Soul Parlour, the Rendezvous, the Manhattan coffee lounge, Verrechias, Rod Stewart, Paul Jones, Simon Dupree & the Big Sound, Gentle Giant, the St. Louis Checks, Soul Society, Heaven, Coconut Mushroom, Rosemary, Jon Isherwood and others.